AMSOIL Racing has a new home on the World Wide Web. Debuting in March, www.amsoilracing.com is a sleek website dedicated to everything related to AMSOIL racing and promotional events. The new website layout provides easy navigation and features up-to-the-minute racing news, while allowing the company to provide a vast selection of exciting videos. Each corporately sponsored AMSOIL racer, including supercross/motocross, off-road, powerboat and snocross, is provided a place in the spotlight. Simply click the “Racers” link on the top of the page to reveal pictures and links for each AMSOIL racer. Select a link to see a bio and highlight video featuring the racer. AMSOIL-sponsored series and events are categorized in a similar fashion. Click the “Series” link for access to pages dedicated to AMSOIL-sponsored series such as the AMSOIL Championship Snocross Series, Traxxas Off-Road Championship presented by AMSOIL and Monster Energy Supercross. Click “Events” for access to AMSOILsponsored events such as the Sturgis Motorcycle Rally, AMSOIL Engine Masters Challenge and AMSOIL Great American Circle Track Tour. The AMSOIL Racing and Events blogs have a new home at www.amsoilracing.com. Simply click the “Blogs” link on the top of the page to keep up with the latest AMSOIL racing news and promotional events. Click the “Media” link for access to a full library of exciting AMSOIL racing and promotional videos. Located under the “More News” section, a new feature is the addition of six weekly columns. The “Inside Line” column provides an insider’s view to AMSOIL racing by digging beneath the surface to reveal storylines not covered in the main press releases; the “Off Track” column takes a look at AMSOIL racing activities away from the track; the “Products the Pros Use” column spotlights the premium AMSOIL products AMSOIL racers use for a winning edge; the “Race Prep” column highlights an upcoming AMSOIL event; the “Pro Pro?? le” column takes a closer look at the lives and careers of AMSOIL racers and the “As Seen On” column discusses AMSOIL coverage in the media. The new racing website provides easy access to the latest AMSOIL racing schedules. Check out the “Upcoming Events” section for the latest live racing and television schedules for AMSOIL-sponsored racers, series and events. As with the previous AMSOIL racing pages on www.amsoil.com, the new website at www.amsoilracing.com allows AMSOIL Dealers to provide racing links on their own websites that are embedded with their Z.O. numbers, allowing them to receive credit for sales once visitors check into the AMSOIL Online Store. To link a Dealer website to the new racing website, simply use the same basic linking syntax used to send visitors to the AMSOIL website: www.amsoilracing.com?zo=xxxxxx (replace xxxxxx with ZO#). The racing website will track visitors for a set number of days, and if they choose to follow a product link back to www.amsoil.com, the referring Dealer will receive credit for any sales. Kevin Windham has proven not every champion claims the most points at the end of the season. 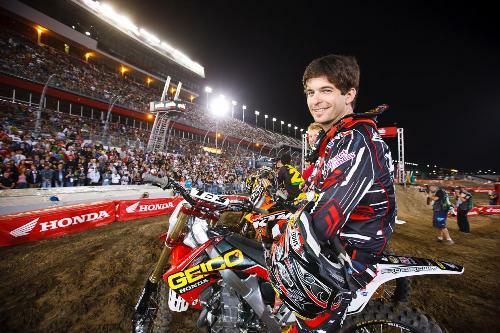 Despite a pair of Supercross West Lites championships early in his career. He has yet to win a title riding a 450, finishing second in season points more than any other rider in history. He also holds the distinction for winning the most races without a Supercross or Motocross title to show for it. But few would know it given his popularity. Following his early success racing 250's, K-Dub consistently challenged legends Jeremy McGrath and Ricky Carmichael for titles, falling short each year. One of Windham’s toughest moments came in 2002, when he broke his femur and left racing for more than a year. In 2003 he returned aboard the AMSOIL/Factory Connection Honda CRF450R and was the only rider able to keep the dominant Carmichael in his sights, taking a pair of wins but again falling short of the championship. Between Supercross and Motocross, the Baton Rogue, La. native has finished the season in second place a combined eight times. Today, the oldest rider on the track is still in hot pursuit of that elusive championship riding for the /Geico/AMSOIL/Honda team. He resides in Centreville, Miss. with wife Dottie and their three children. When not flying high on his Honda, K-Dub pilots his personal airplane out of his home hangar in Mississippi. Windham finished fifth at the Dallas Supercross this past weekend. Monster Energy Supercross heads to St. Louis this Saturday.